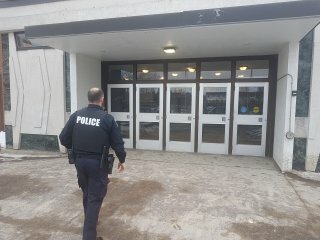 When it comes to serving and protecting the youth of Belleville, the police force is there to keep a safe environment at the schools around the city they are assigned to and guide those in trouble to the services and resources available to them. Cst. Paul Fyke, community resources officer for secondary schools, works with students across the various schools in the city to keep consistent communication to uphold the safety. Fyke has been the officer overseeing secondary schools since September 2018, he comes with nine years of experience working with youth to go along with his nine years as an officer. Part of what helps the police better serve the community is for students to speak up if they feel their safety or their school’s safety is at risk. We rely on students to be safe for themselves, so if they see or notice something, speak up. This includes issues online as well, such as bullying, harassment, and threats. There are resources available to help prevent cyberbullying but we need intuitive from the youth to be willing to provide support and information. Too many people ignore warning signs before it is too late and even informing someone close to the person could go a long way towards preventing a tragedy. One of the other ways we provide support is through the Intersections Program, a service centered towards youth who are engaging in behaviours not necessarily criminal, getting the help they need to bring a positive impact to their life. If you or someone you know are in need, don’t hesitate to get in contact as Officer Fyke and the police are always open to help.